Suicide Squad: Is DC Scared? Avengers: Age of Ultron- Sexist or in Need of an Editor? I Love You, Pop Culture. Sincerely, Ready Player One. Animated films have a unique and difficult position that most movies don’t face- they must be entertaining for their intended audience (the five-to-twelve-year-olds), as well as amuse the parents who brought the intended audience, AND it must bring back delight and memories for the twenty-something-year-olds (like me) who still enjoy watching movies meant for kids because we don’t feel like grown-ups just yet. Many animated films can’t fulfill all of these requirements: I guarantee my parents haven’t enjoyed every movie I dragged them to when I was little, and I certainly haven’t enjoyed every animated film that I’ve watched since I’ve grown up a little bit and stopped being amused by simple humor. 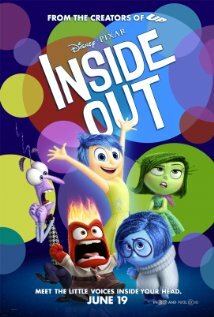 However, in just 94 minutes, the new Disney/Pixar film Inside Out manages to provide entertainment, delight, and even some extreme feels to all members of its audience- an experience I haven’t had at a Disney/Pixar film since Toy Story 3 (2010). The movie focuses on 11-year-old Riley and the five little voices in her head that control her and her daily choices: Joy (played by Amy Poehler), Sadness (Phyllis Smith), Anger (Lewis Black), Disgust (Mindy Kaling) and Fear (Bill Hader). They each decide how Riley behaves throughout the day, and her decisions lead to the creation of “core memories”, which determine the major components of Riley- goofball, family, friendship, honesty and hockey- and, as Joy was the first emotion awakened when Riley was born, most are happy memories (which she is very proud of). Conflict arises when Sadness tries to be more involved in Riley’s day after a move from Minnesota to San Francisco, which causes Joy, Sadness and the core memories to be lost in “Long-term Memory”, causing Riley’s emotions to spiral out of control. The film transitions beautifully between Joy and Sadness’ trek through Riley’s head back to the control center and Riley’s day-to-day life, telling two stories and yet one story at the same time. 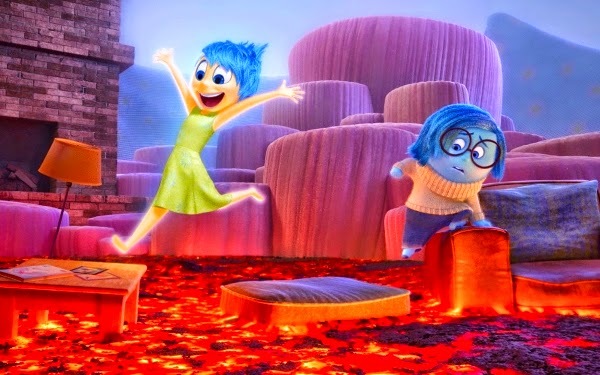 This film’s tale centers around Joy trying to make Riley happy all of the time, and during the journey you are rooting for her to make it back to the control center because you want Riley to be happy, but that’s not really the story that Pixar wants us to walk away with. Each of the little voices gets a chance to shine as Riley’s protector, showing us how important all of the emotions are in our lives. I mostly only know Poehler by reputation, only having seen her in Mean Girls and Baby Mama before this film (oh wait, apparently, she was also in Shrek the Third, but are we really counting that? No? Okay), and so I was expecting her performance to be purely comedy based on that reputation. I was not completely correct- while Poehler definitely brought comedy to the film, she was able to walk a line that was completely essential to the story- she was also able to turn off the funny and deliver a powerful serious performance, alongside Smith, who shined in the supporting role of Sadness. While all the actors are fun to listen to, Poehler and Smith deliver the truly great performances. It was also quite an experience as a score enthusiast to go from hearing Michael Giacchino compose ground-stomping and larger-than-life pieces for Jurassic World to the bright, bouncy and downright adorable pieces of Inside Out. It never ceases to amaze me the range that composers can have, and between these two hot summer hits, you can hear all the ends of Giacchino’s range perfectly. If there is any complaint to make about this film, there are little details a nitpicker might pick up on (I certainly did) where some of the rules of how a person’s personality works that don’t quite match up. You might wonder what happens when a train of thought isn’t working, or if when the core memories don’t work, does Riley ever get them back? But these are things that kids won’t notice, most parents won’t notice, and honestly, even if you notice it won’t change how you enjoy this movie. I am not too proud to admit that I cried. Admittedly I am a bit of an easy crier (my mom can testify to this, seeing as I still can’t watch Sisterhood of the Traveling Pants without tearing up) but an animated film hasn’t made me cry like that since Toy Story 3 reminded me that I was too big to play with my toys and they were sitting in my closet, lonely and waiting for me to come home. 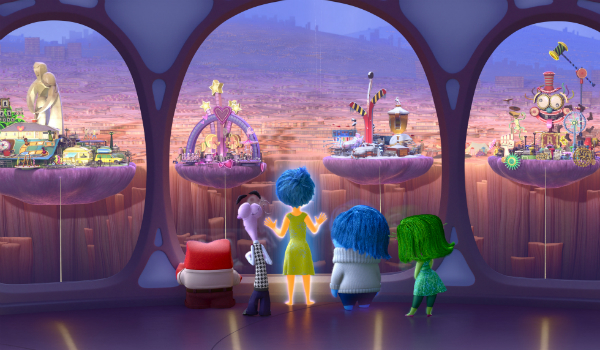 Inside Out will remind you of what it is to grow up, to adjust to those confusing and crazy feelings, and you will remember all those little things about being a kid that maybe you forgot. And, if you’re anything like me, you’ll be trying to figure out which emotions make you YOU long after you’ve left the theatre, and I think that wanting to decipher yourself is definitely something special. Perfect for kids, adults, and those in-betweeners like me!